Four years ago and nearly 9,000 miles from San Antonio, the Moipei triplets — Marta, Magdalene (Maggy) and Mary — made the decision to attend St. Mary’s University. 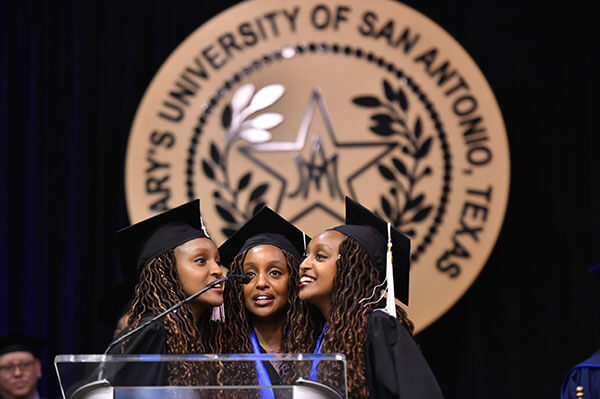 Marta (from left), Magdalene and Mary Moipei sing at the University’s 166th annual Spring Commencement in May. “By coming here, I feel like we changed the course of our future,” Maggy said. The Moipei sisters have been called “Kenya’s greatest musical export” and “Kenya’s favorite daughters.” The triplets, along with their younger sister, Seraphine, who remained in Kenya, have performed together since they were children, singing for audiences around the world. At a young age, Marta, Maggy and Mary dreamed of breaking into the American music industry. “Coming to St. Mary’s was a stepping stone toward that goal,” said Mary, who, along with Marta and Maggy, graduated with a bachelor’s degree in Music in May. The triplets first learned of St. Mary’s through the Rev. Martin Solma, S.M., St. Mary’s Chancellor, who had lived in Kenya for 25 years and was a close family friend of the Moipeis. Solma shared the sisters’ CD with St. Mary’s President Thomas M. Mengler, J.D., hoping to convince him that the triplets should attend St. Mary’s. “I called him up the next day and said, ‘I’m in,’” Mengler said. “What I really like about St. Mary’s is that it’s not always about yourself. It’s about living to serve others,” said Mary of how the triplets have embraced Marianist values by choosing to give back through song. While at St. Mary’s, the Moipeis have shared their gift with the San Antonio community and beyond, with an appearance at Alamo City Opera’s Broadway vs. Opera at the Pearl Stable, multiple performances at the Tobin Center for the Performing Arts and an international concert stop in Toronto. In 2015, they sang the national anthem before a San Antonio Spurs playoff game — a performance that was on their pre-graduation bucket list and a defining moment for each sister. No matter how small or grand their performance, the Moipei triplets said they always try to carry their values in their voices.